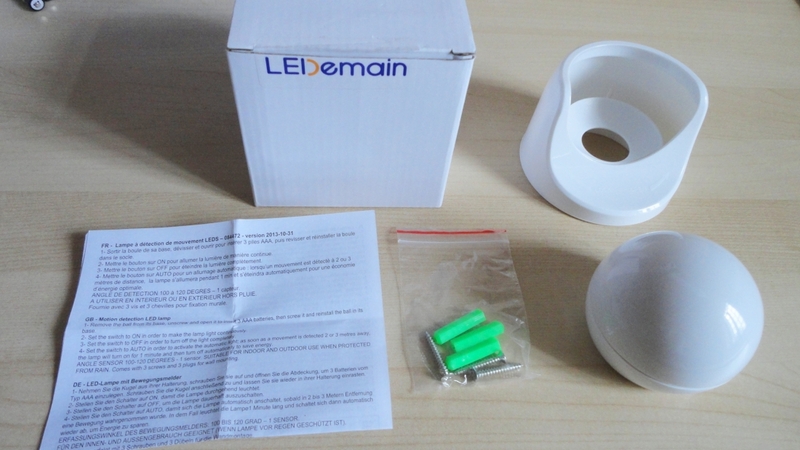 Another excellent product from LEDemain, offering some very useful features. 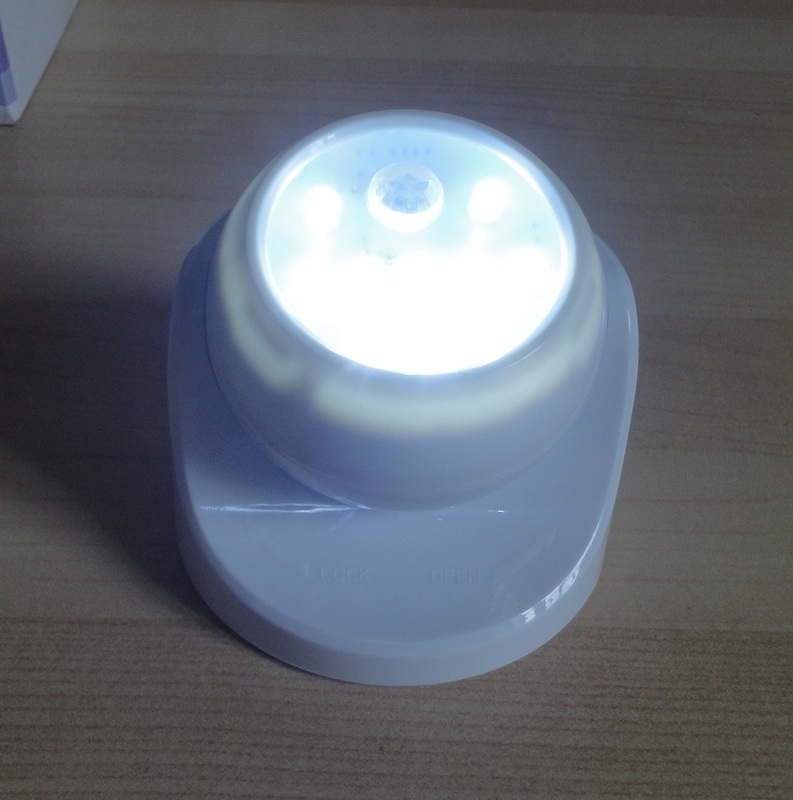 I received a free sample for evaluation, and this has quickly become one of my favourite security lamps. This motion-activated LED lamp is a sphere cleverly designed to be a wall-mounted fixture, when slotted into its holder, but which can also be used as a removable bright torch. In addition, the stand/holder has a flat and stable base so the light can also sit on a shelf until you find the perfect place for it. Since the light unit can rotate freely 360° inside the holder, it can be angled any way you want. 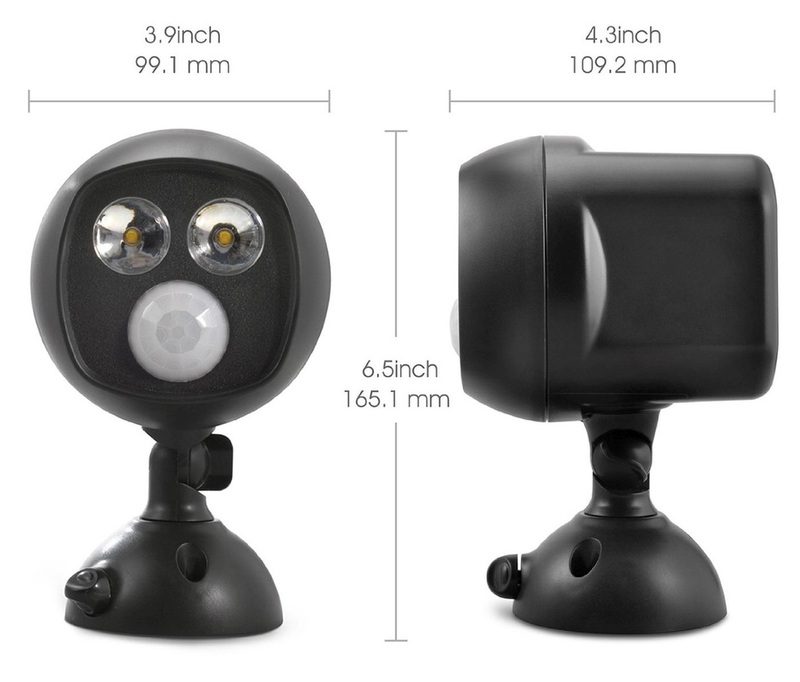 Three mounting screws and wall plugs are included in the package, as well as a brief user's manual. 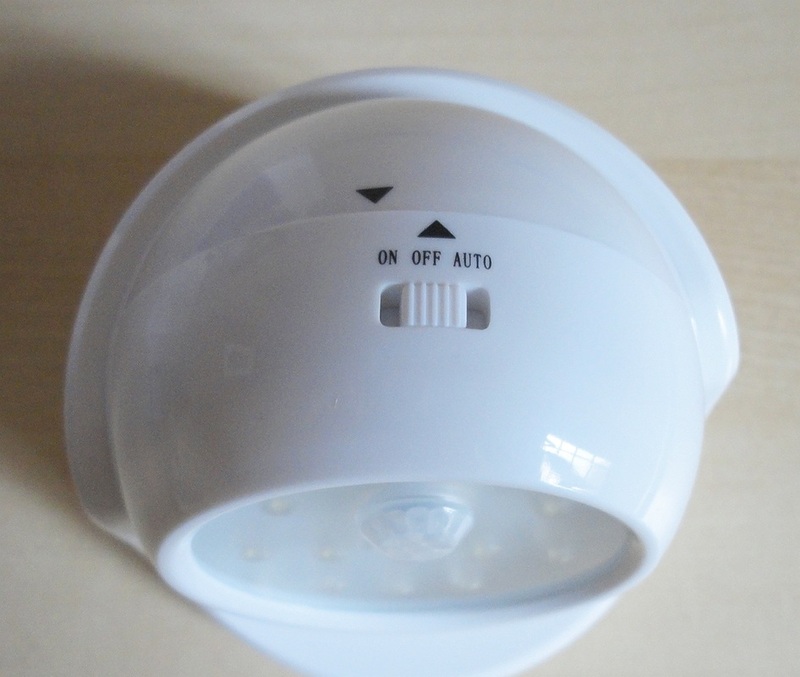 AUTO – light comes on when movement is detected in the dark, up to 3 metres away and within a radius of 120°. It is powered by three AAA batteries (not included) and can be mounted outdoors, provided it is sheltered from the rain. The unit is well made and appears solid and durable. In my tests, the sensor reliably spots a person and will keep the light on as long as some movement is detected, otherwise it goes off after 34 seconds. 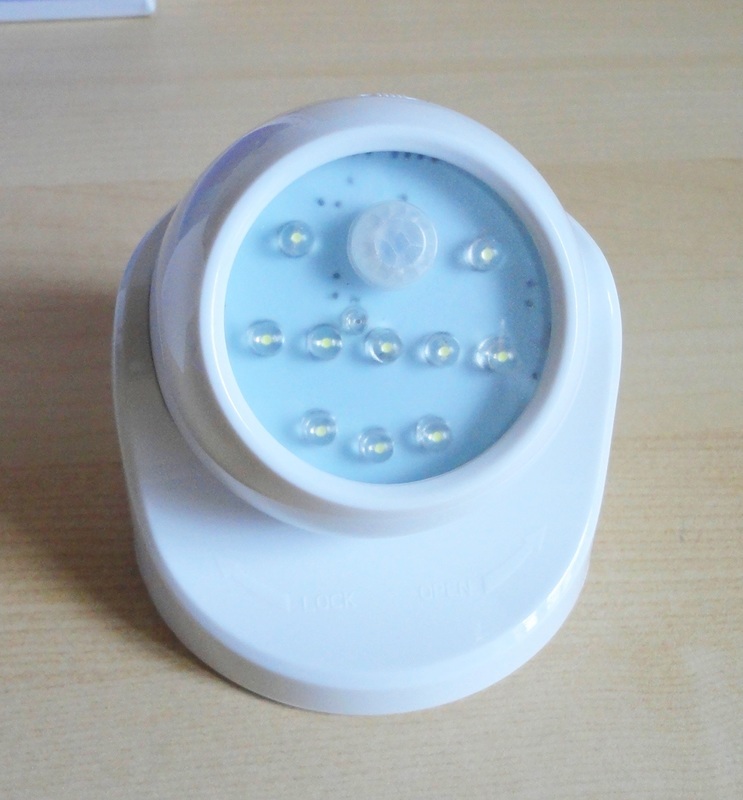 Testing it with your hand is not useful because I believe that these PIR units are designed to sense larger objects, otherwise every moth or small animal would trigger it, prematurely draining the batteries. We have mounted this lamp in a small veranda, just above the kitchen door. The existing fixture could only be switched on from inside the house, which made it useless when searching for the lock at night. Now, the light illuminates the door when it senses a person approaching, and it's much easier to lock or unlock the door in the dark. It also means that we have an emergency flashlight handy for when our cats are late coming home. This security outdoor/indoor light fixture is powerful enough to illuminate a pathway, access road, corridor or a building facade. Unlike the recent Models TT-HSL001 and TT-HSL002, this lamp is powered by four Type D batteries and is, therefore, ideal for those places where a solar-powered fixture would not work, such as anything with a northern exposure, a spot shaded by trees or eaves, or an indoor location. It's also great for places where other light sources would confuse a solar captor. A clear manual in four languages is provided, as well as installation screws and wall plugs (you will need three because the whole thing becomes quite heavy, once the batteries are in place – 850 g or nearly 2 lbs). 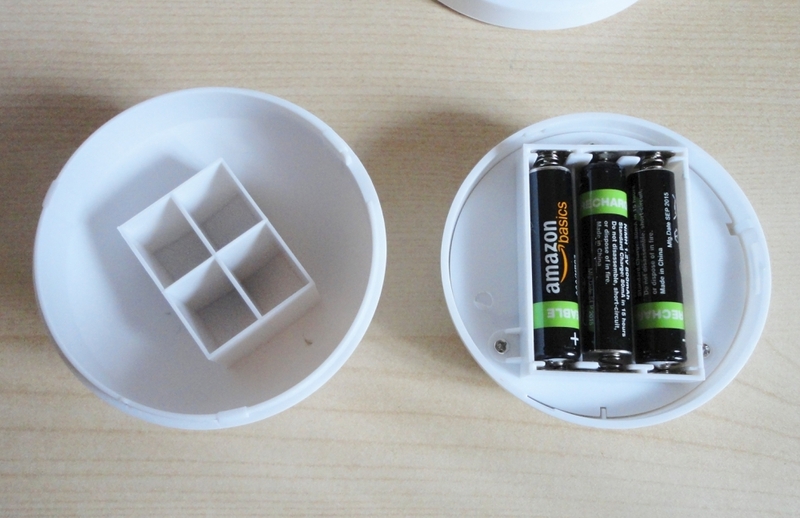 The battery housing opens by twisting the two halves in opposite directions (unscrewing them, essentially) and this can take a bit of force but it does produce a very secure waterproof seal. I was amazed at the amount of light this small fixture can produce (300 lumen according to the specs). At night, it is even more impressive. Once activated by movement, the light stays on for 20 seconds (versus 30 seconds for the solar varieties) but the detection scope is much greater (5 metres versus 3 metres). The spotlight is mounted on a neck that allows a large range of adjustments. The lamp can be tilted at the neck juncture via two locking knobs and the entire thing can be rotated up to 180 degrees. With these three new products, TaoTronics have brilliantly answered the need for effective, motion-activated night illumination that does not require wiring. Just about anyone can install this handy, versatile light fixture. The only thing missing to make this perfect is an ON/OFF switch. Other than that, I find this LED light of excellent build quality, practical, economical to run and surprisingly bright.